I would just like to start off by saying happy new year to everyone reading and I hope 2014 is a great year for you! 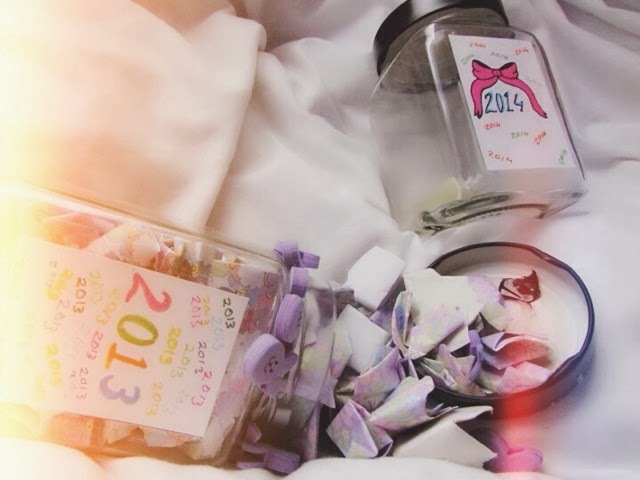 One thing I did this year (as well as last year) was create a memory jar. The concept is to fill it with good events that happen during the jar, then on the 31st of December or the 1st of January 2015 you open it and remember all the fun and happy things that happened over the course of the year. I did it for 2013 and it's crazy how much you can forget what happend, a lot goes on over 365 days! First of all, I got a jam jar (all the jam had been used - of course) and cleaned it, on the lid I made a small hole with a knife (I advise doing this rather than getting a screw off lid as through the year it gets so full it may overflow when you unscrew it) and then put Sellotape to round the edges of the hole so I don't cut my fingers when putting slips in it. I made a little cover with '2014' on it and will put a ribbon around it when I find one.